I must admit I was really nervous flying with kids for our long flight from Melbourne to Kuala Lumpur when the kids were aged 9, 7 & 5. The flight is 8 hours and previously the longest we had flown with them was 4 hours. Now I must mention here my kids have flown a lot just not long haul. There are many posts out there with tips for long haul travel. Long haul travel is never fun but there are things you can do that make it a bit easier. See my tip below to help you and your kids get through what is generally the longest hours of your life!! We used to live in Sydney and home is Melbourne so the kids have regularly flown between Melbourne and Sydney, we have also flown Melbourne to Queensland a few times too. We have also driven from Melbourne to Sydney a few times, which is a 10 hour drive with a stop for food, so I knew they could do this. All up we had 8 flights over 16 days on our last trip, hence my concern that things might get just a little bit hairy. I might just get the worst mum in the world award here for saying this but when we fly lollipops are fair game. Eat as many as you can, yep you heard me, if they had time for 10 I would let them eat them! Luckily enough the novelty normally wears off after 2 maybe 3 at the most. The reason for this is that it helps with their ears. I have only ever had one issue with the kid’s ears when flying which was Caelan and that was because we had started to descend before I coughed up the goods. I hear all these little kids on flights crying on the descent and I just think to myself, ‘mum if only you had a lollipop you would save yourself so much trouble’. I have on occasion given them to other kids if it’s ok with their parents. I remember when I was younger Qantas would hand out boiled lollies before the descent, I think all airlines should return to this practice, plenty of parents would be chuffed. I decided every flight we had I would pre-order food, the reason for this is that it fills in time! By the time the meals are served, they eat them and then wait for service to then come and clean up the rubbish, this is 1 hour less that they need to be entertained. It also means that if we get caught in immigration or customs with long lines I know they have eaten and therefore not starving and annoying me for food. Also if we fly at meal times it’s one less meal I have to organise. The meals on airlines such as Air Asia are about $5 AUD if pre-ordered, that’s pretty good value if you ask me. I’m not normally an advocate for long periods of time on iPods, on flights this is also fair game. Alannah, who is nearly 10, will happily sit there for nearly the whole flight on her iPod only coming up for air to eat and go to the toilet. Keira will spend a good few hours especially if she is sitting next to her sister. I’m happy to allow this as if it keeps them happy, then it’s a peaceful flight for the rest of us. Caelan, who is 5, on the other hand is not so keen on his iPod. For him, we download a movie to our iPad, I make sure it’s a new one or a favourite and if I get him to watch it twice, it’s a good day. Most times he will watch it twice and that takes up at least half the flight. Alannah will happily sit and read a book. I feel a bit ashamed as on our flight to Kuala Lumpur, Craig and I stopped at the airport newsagency and bought some magazines. Alannah asked me for a book which I was a bit snappy about as we had to pay top dollar at the airport and I could have paid a lot less at Big W. Craig said ‘buy it’ which I did and she had finished it by the time we arrived in Kuala Lumpur! I hadn’t even finished my Lonely Planet magazine! She loves reading though and reads a lot, Harry Potter is the book of choice at the minute. The little ones aren’t really reading that much so maybe a couple more years and they all might sit there and read, wont that be awesome! I went to the local $2 shop and got 3 colouring and activity books and some crayons and pencils for them to use on the flights. I thought I would end up carrying them all the way around Asia and bringing them home again. To my surprise, Keira and Caelan got good use out of these and Alannah gave hers a good go too. This filled in plenty of time and next time I will be sure to get either 3 sets crayons or 3 sets of pencils to save me the trouble of the fighting over the crayons believe it or not! Last but not least, I only allow them to drink water. Every other time I have bought them drinks they don’t drink them. We bought Milo and they didn’t like it so then I was stuck with an open drink that was sitting there waiting to be spilt. Water bottles are a better option as the lid can be put back on to avoid spillage and can be put in the elastic pocket in the back of the seat in front of you. This then means we can get back to colouring, reading, movies or whatever they are doing without me having to look after the drink until the hostie returns. Also water is better for them and it keeps them hydrated. Lip gloss is another plus, the girls think their awesome with their own lip gloss and stops their lips from cracking from the dry air on the plane. Sounds like I have it all sorted right? Now for the truth, the girls travel really well but Caelan does about 6 and a half hours and then it all goes a bit pear shaped! At around about 6 hours he has a little tantrum which we just ride out and then he comes good for the last hour or so. Long haul flights are hard for any kids but if you get through with minimal tantrums you have had a good day. When we arrived in Kuala Lumpur, the couple in front of us who have kids in the early twenties, turned around and said to me ‘your kids are a credit, they behaved amazingly on this flight, you should be very proud’. I nearly started crying, not many people have given me such a lovely compliment and I was so proud of them. So how did we go? You can read my review of Air Asia for the update. Its all worth it in the end when you walk through the gates of Disneyland for the first time or you are staying in a luxury villa in Vietnam with a private plunge pool and personal butler! It’s short term pain for long term gain I say! 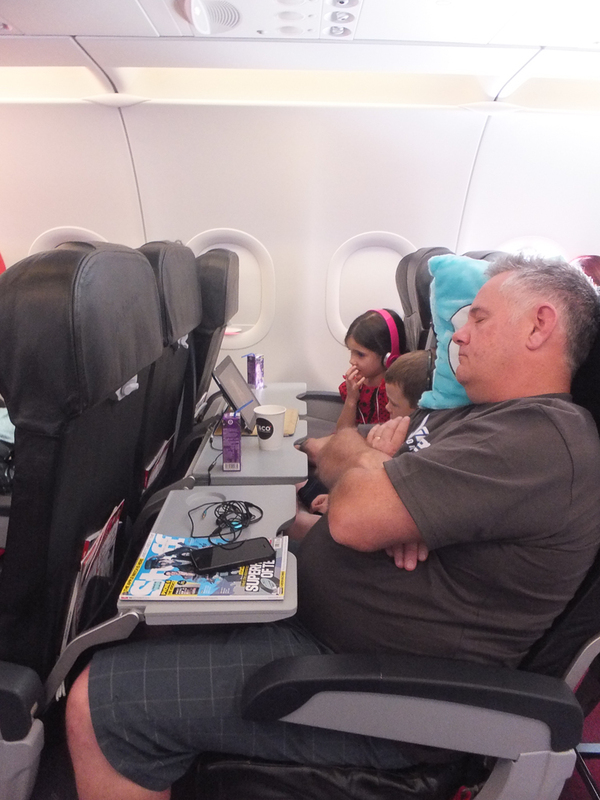 Have you done many long flights with your kids? Feel free to add anything you think I have missed. Always happy for other readers experiences and advice, you can reply in the comments box below. This is how it normally ends! Fabulous tips, I’ll be sure to bring along colouring in books for our trip. Thanks SJ, the colouring books were invaluable, I was surprised by how much time the kids actually spent using them. Tip, if you have the space, pack a packet of crayons for each child! Mine were arguing over who had the crayons and who shared the pencils!